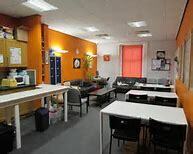 The drop-in offers a comfortable space with friendship and support for people with housing and other social problems. Services include: food and drink, clothing, laundry, showers, post, telephone room, IT access, lockers, games and books. We offer help with budgeting, finding accommodation and looking for employment.